This is a smart, snappy collection of apoca-lit now. Apocalypse, as a literary concern, comes in and out of fashion. Ever since HG Wells posited worldwide Armageddon in 1895’s The Time Machine, the idea of the future as an awful place has cast an irresistible lure over both readers and writers. There are obvious classics of dystopian fiction—We, Brave New World, 1984, A Clockwork Orange—as well as numerous more recent efforts, such as Russell Hoban's Riddley Walker and Margaret Atwood's The Handmaid’s Tale and Oryx and Crake. The past decade has seen something of a mini-boom in "apoca-lit": Cormac McCarthy's The Road was a huge seller, while Brits like Jim Crace (The Pesthouse) and Rupert Thomas (Divided Kingdom) have vied with Americans Matthew Sharpe (Jamestown) and T. Coraghessan Boyle (A Friend of the Earth) to see who could create the most compelling vision of society flushing itself down the tubes. Continental Europe has gotten into the act as well, with such works as José Saramago's Blindness. These examples touch on only a handful of so-called "literary" authors working with the material; mainstream SF has of course been dishing out unsavory visions of the near-to-medium-range future at a steady clip. One can almost imagine the would-be dystopian novelist struggling to formulate the setting for the next in this apparently endless parade of doomy books. What disaster remains ripe for exploration—global war? Food shortages? Breakdown in law and order? Mutant killer viruses? The possibilites go on and on. Computer collapse? Climate change—and if so, what kind? Floods? Drought? Steven Amsterdam found a clever solution to this dilemma. Amsterdam, an American relocated to Australia, formed his novel-in-stories out of a series of 20- to 25-page episodes, each built around the onset of yet another catastrophe. The unnamed first person narrator remains constant throughout, and other characters pop up in several stories, most notably the narrator's parents and his girlfriend, Margo. What changes is the surrounding environment, the dangers and survival strategies that they entail, the reliability (or not) of strangers. The rules, in other words, to which one must adhere for survival. The result is a constant source of disorientation for the reader, as the assumptions and premises that were in effect for the previous story may well be obsolete in the next. It's a clever structure, and Amsterdam works it fabulously well. Opening story "What We Know Now" sees the narrator, still a child, trundling off with his parents into the countryside on New Year's Eve, in deference to his father's conviction that a computer error will bring society crashing down at the stroke of midnight. Y2K is never mentioned by name but the connection is obvious, and Amsterdam uses this story of a disaster that never happened to prepare us for a series of them that do. More importantly, the narrator is sketched out for the reader, and his relationship with his parents—and them with each other—serves as an important groundwork for much of what follows. Speaking of what follows—it's pretty bad. A barricaded urban-rural divide has opened up in the second story, "The Theft That Got Me Here," while "Dry Land" features—you guessed it—rampant flooding. As homes and farms are washed away, food grows scarce and panicking herds of wild animals add to the mayhem. Our narrator tromps through the landscape, coping as best he can, but his task isn't made any easier by the humans he meets. Other stories feature disease, lawlessness and overarching societal breakdown as backdrops. Maybe the most impressive trick that Amsterdam pulls off is his ability to keep the attention focused on the narrator and his relationships, despite all the Armageddon wailing away in the background. This is not a story about the end of the world; it's the story of one man's life as he makes his way through the planet's convulsions. There are no scenes of disasters happening, cities crumbling, mobs fleeing in panic. In story after story the catastrophes have already occurred, and the survivors are left milling around—or occasionally doing violence to each other—while striving to carry on. 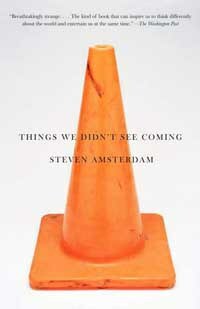 Amsterdam's language is spare and to the point, reflecting his narrator's terseness. "I only ever signed up for the money. If I hadn't taken a government job I would have gone completely under. Still, I've wanted out of this one since the first day." No doubt there is the potential here for longwinded, richly detailed description, but the narrator has little interest in rambling. This is a short book narrated by a concise individual. "We eat dinner more or less in silence. I show them how to get the most out of the rat and the bark and the spices in the house." There's really not much more to say. Readers looking for over-the-top portrayals of The World in Crisis!! and Humanity Gasping Its Last Breath!! will perhaps be disappointed in this book's low-key tone and understated restraint. Others, looking for a more ruminative view of the world's end—perhaps not with a bang so much as a series of whimpers—may find Amsterdam's close-focus approach to thinking about the unthinkable to be chillingly effective.